PUNXSUTAWNEY, PA—As a due punishment for the animal having incorrectly predicted an early spring, local residents gathered in a public square today to bear somber witness to the beheading of weather-prognosticating rodent Punxsutawney Phil as part of the region’s traditional Groundhog Slaughtering Day. “Punxsutawney Phil must suffer the consequences of his erroneous and poorly conceived forecast,” said town councilman Kenneth Joachim as he held the rodent’s trembling body against the chopping block and lifted an ax high, bringing it down in a single, assured stroke that cleanly decapitated the animal, a tradition that stretches back to the town’s founding. 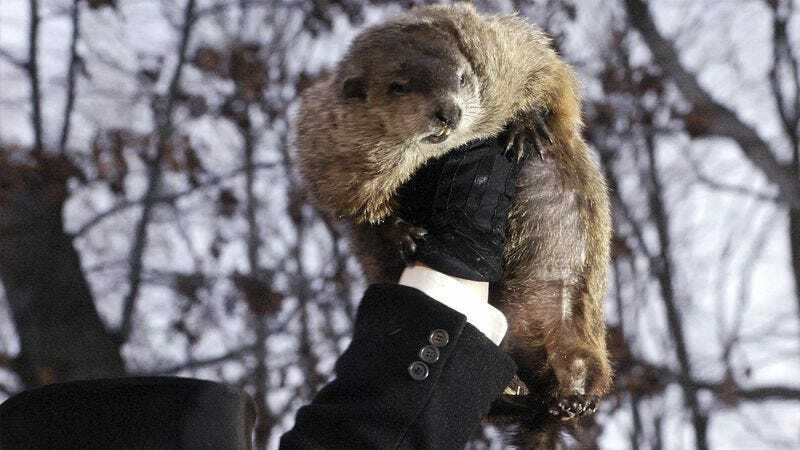 “Let this gesture stand as a stark reminder to all future groundhogs who seek to presage winter’s end without evidence or merit.” Town council members then announced that Punxsutawney Phil’s headless body would be ceremonially devoured raw by the mayor later that evening.